The Google search bar is probably one of the few widgets we actually keep on our home screen and we’re sure it’s the case for many of you as well. Whether you activate it on your home screen or by via the home button shortcut, Google Search has become a part of our everyday lives, useful for not just looking up random facts, but also real-world information like nearby restaurants or businesses. Google knows this and it’s one of the reasons we’ve seen them play around and tweak the Search bar on a few occasions. A few months ago, someone spotted shortcuts for Recent Searches, What’s Hot, and Nearby that were added to the Search bar suggestions and now it seems Google is testing a newer tabbed interface. According to the user who posted the above screenshot on Reddit which seems to be removed for some reason, the Search Bar now features two tabs — one for History and another for Nearby — which appear after tapping on the search bar. 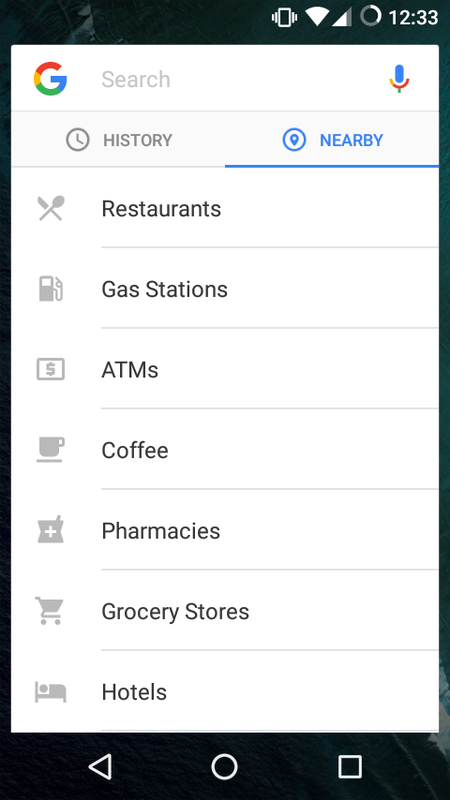 It’s similar to the previous UI we saw in testing, with history obviously showing previous search history, while nearby pulls up different categories for restaurants, gas stations, ATMs and coffee. Once again, it seems this new tabbed search bar is only in testing and although it could rollout more broadly, we wont be holding our breath. What do you guys think — would you like to see this permanently added to Google Search?